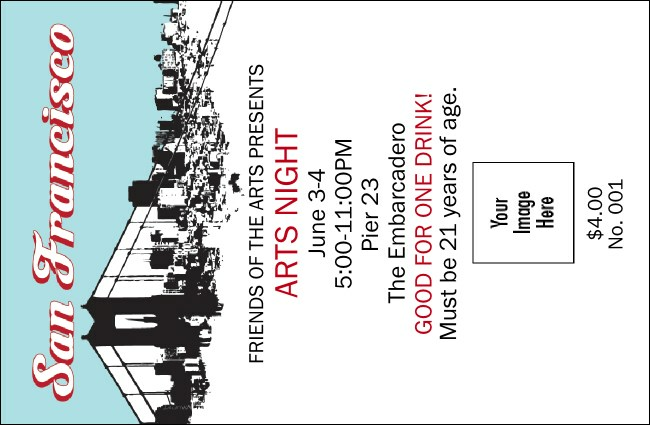 Here's a San Francisco Treat for thirsty patrons and busy bartenders, the San Francisco Drink Ticket with a black and white cityscape featuring the Golden Gate Bridge, along with a space for you to upload your own logo. Sell more drinks with less hassle when you customize a Drink Ticket to match the rest of your publicity materials. Take the high ground with hot local designs from TicketPrinting.com.